Here are some of my thoughts on Marathon Man. I am so glad that I added Marathon Man to my Blindspot list for 2017. It’s interesting; this is one of those films where you might read the synopsis and have certain expectations about where the plot might end up, depending on how many films/documentaries about Nazi war criminals you’ve seen. But this film had some nice surprises. Dustin Hoffman is, of course, excellent in this. He plays a very convincing academic-turned-reluctant-action-hero. And he shares excellent chemistry with Laurence Olivier, whose frightening performance is an absolute highlight. My knowledge of Laurence Olivier’s filmography is disappointingly sparse, but I was so pleased to see a different side of him here – a disturbing, villainous role that resulted in an Oscar nomination for Best Supporting Actor. And you also get a wonderful performance from Roy Scheider, who arrived at Marathon Man straight out of Jaws (1975). I was surprised by how deceptively action-packed this film was. But it was action-packed in a very thoughtful way. 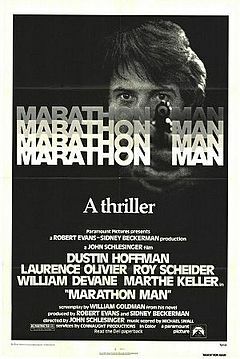 I loved the way that Marathon Man handled its suspense. It’s simply menacing. There’s a scene on the street towards the end of the film (I don’t want to let any spoilers slip) that was perfect, and had me sitting right on the edge of the couch. The direction by John Schlesinger was so good. But the cinematography by Conrad Hall was unforgettable. There are a number of ‘iconic’ scenes in Marathon Man that are similarly unforgettable. Number one – a particular scene in a bathroom, involving darkness and some very threatening characters indeed. Number two – a torture scene involving teeth, which you may have heard of already. This scene is extremely uncomfortable to watch if, like me, you have a fear of someone messing about with your teeth. The scene is directed such that you almost feel the victim’s extreme dental pain. Excruciating. Also, apparently this film is the source of the “Why don’t you try acting?” film anecdote that’s been floating around since forever. All in all, Marathon Man is an excellent film – but it’s not one to choose if you’re after a relaxing, comfortable film to watch. If you’re after clever, thrilling action with a painful twist, this may be for you. The dentist scene still gives me the chills. Me too! Something about teeth drilling is just so disturbing. You can almost imagine it. No thanks!